Construction commenced in late July on the first home in The Gables, Box Hill, a $4 billion masterplanned community. It is only 12 months ago when Celestino, developer of The Gables, commenced $40 million worth of civil works on the new community. Matthew Scard, Celestino Development Director said the civil works on the two gateway intersections, and the roads and infrastructure for the first 540 lots is now complete as the first home gets under construction. “The start of construction on The Gables first home shows Celestino is committed to getting future residents into their new home as soon as possible. “To have our first home buyers, Shaun Mothersole and Kristy Hooper commence construction means they could be moving into their new home for Christmas this year. “We cannot wait for The Gables first residents to enjoy the benefits of living in a masterplanned community that will ultimately provide over $315 million worth of community infrastructure, services and utilities. “When our first residents move in, they will be able to enjoy a family-friendly local pocket park, with the design chosen by the residents – ‘The Orchard’. The park will comprise a variety of children’s play equipment and open lawn areas with direct access to the future Riparian Corridor through the adjacent Linear Park” said Mr Scard. The Gables, Box Hill will feature over 200 acres of open space, a network of cycle and walking paths linked to a future town centre, recreational facilities and roadways, a K-6 primary school co-located with one of two sporting fields, a community centre, and nine neighbourhood parks embellished with play equipment and community facilities. Recently engaged, Shaun and Kristy said they looked at several new developments in the Box Hill area, but were impressed by what was on offer at The Gables. 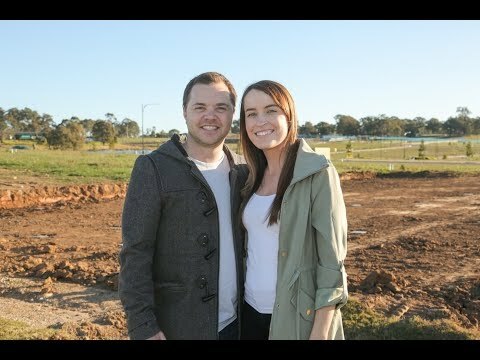 With children part of their future plans, Shaun and Kristy will have plenty of space in a 4 bedroom single storey home being built by Domaine Homes that also includes two living spaces and a double garage. Matthew Scard also said The Gables Box Hill is set to be one of the most liveable communities in The Hills District and the North West growth area of Sydney. Since the project launched nearly two years ago over 700 blocks of land has been release to the market, 95% of the blocks have sold and over 50% of the sold lots have settled.